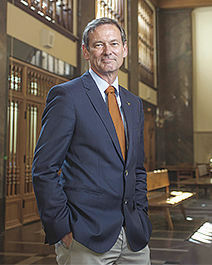 Dr. Brent Iverson is dean of the School of Undergraduate Studies at The University of Texas at Austin. It’s perhaps trite to note that change in the workplace is inevitable. Many, if not most, of today’s college graduates will need the intellectual breadth and the confidence to change professions, probably more than once. The ability to thrive in such a dynamic work environment comes from taking rigorous college classes in many different disciplines. Unfortunately, that is exactly what many current students are actively avoiding. We need to do a better job of making sure the college experience requires and challenges students to expand their academic “comfort zones” to be as broad as possible. The hyper-competitive college admissions process is undoubtedly to blame for discouraging academic risk-taking, but the truth is that too many students are still approaching college as if they were preparing for a single, lifelong career path. Students need to look well beyond their first job and think be prepared to be ready to strike out in entirely new career directions when the time is right. I grew up in Palo Alto, California. My father was an electrical engineer and worked for one company for more than three decades until he retired. My father’s career was like a marathon, one step after another in the same race. As with much of the high-tech industry in the Santa Clara Valley at the time, his work centered around national defense. And like training for a marathon, my father’s education focused on the single technical path he would follow for his entire career. Fast forward: My daughter graduated from college a few years ago and retraced her grandfather’s steps back to California, entering the high-tech workforce in what is now called Silicon Valley. But that’s where the similarities with my father’s journey end. My daughter has no expectation of staying at a single company. In fact, she has already worked for three companies in the five years since graduating, while earning a master’s degree at the same time. Rather than staying on a single path, my daughter’s short career has already resembled more of a triathlon than a marathon, with different career phases requiring distinct skills and technical knowledge. And my daughter’s experience is not unique. A longitudinal study from the Bureau of Labor Statistics found that today’s workers have changed jobs close to 12 times by age 48. We know that highly disruptive future technologies in a number of fields are being developed right now. In fact, it is likely that the final careers of many current students will not have been invented by the time they graduate from college. My daughter is successful because of the “intellectual cross-training” she received in college, earning degrees in mathematics and history. The math degree provided a rigorous foundation in quantitative reasoning, logic and data analysis. The history degree emphasized a comprehensive and qualitative evaluation of complex historical events along with practice in critical thinking and writing with power and precision. With that combination, she acquired exactly the kind of dexterity that gives her versatility and an edge in today’s quickly changing workplace. The United States would benefit tremendously in the coming years if all students would use their time in college to broaden, rather than narrowly focus, their intellectual skills and abilities. Students must be pushed to break out and challenge themselves. They will need highly developed critical thinking skills, and they need to get comfortable with public speaking, while becoming persuasive writers and communicators. They will need a comprehensive knowledge of the world and an understanding of the cultural diversity that is the true strength of the United States. They must be able to defend an original argument, conduct research and be able to reason effectively. They will need a strong background in math, science and technology. Colleges and universities also need to change, by building the versatility and breadth into traditional degree requirements that will provide the broad intellectual skills and experiences all graduates will need to succeed throughout their careers in the workplaces of the future. It is our collective responsibility to encourage — and then provide — the intellectual cross-training that students will need when they compete in the triathlons that will constitute their professional lives in the years ahead.